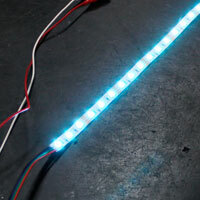 RGB LED Strip Lights are such a versatile product due to the fact that they can easily be cut on the given cut lines and connected at any point between the copper dots on the LED Strip Lights, cut lengths vary between products. See the below tutorial for a complete guide on cutting 4 wire RGB LED Strip Lights and soldering wire directly to the LED Strip. 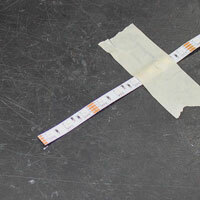 Use a few pieces of masking tape to secure your RGB LED Strip light so it does not move during your solder. 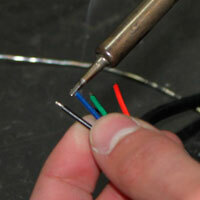 Once your soldering iron is hot enough, tin your 18-22AWG stranded RGB wire by applying a small amount of solder directly to the stranded wire. 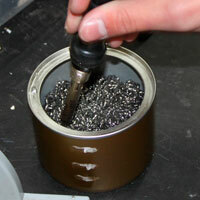 Once you have completed this step your wire should be silver in color and no longer appear to be stranded. 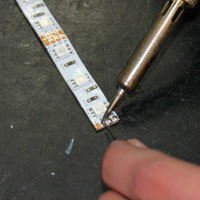 The next step is to tin the copper dots on your LED Strip Light by melting a small amount of solder directly to the copper dots. Be sure not to apply so much that the solder is overlapping, this will cause unwanted color changes on your RGB LED Strip Light. 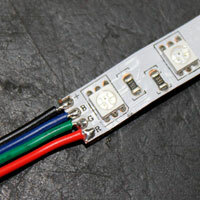 Once you have tinned both the wire and the copper dots on your RGB LED Strip Light you can now mate the two together. Individually place the wire to the copper dots and then place the soldering iron over both in order to heat up each solder enough to melt and become one. Be sure to hold long enough to not create a "cold solder." Once you have properly mated your wire to your LED Strip Light your final result should look something like this. Notice that the solder joints are clean and not overlapping one another. 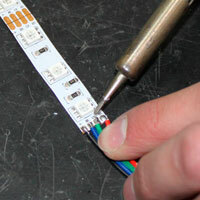 Once dry, connect your freshly soldered LED Strip to a proper power source and test your connection. 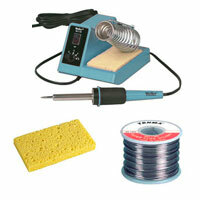 Peel back the 3M adhesive enough to cover up your solder joint with heat shrinking material. 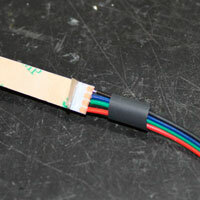 If you do not have heat shrink you can use a small amount of hot glue. 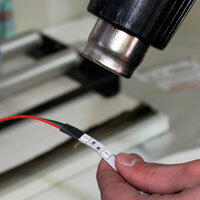 Use a heat gun to shrink your heat shrink to protect your solder joints and then test one more time to be certain of a proper connection.